The catamaran is certainly the fastest sailing boat that exists. Its multihulldesign with makes it light and allows the maximum displacement with the minimum possible draft. The sensation of traveling at high speed while sailing, with the only sound of the wind and the waves, is the one that generates high doses of adrenaline and fun. It is undoubtedly an activity, that does not leave indifferent. What can we offer for catamaran sailing? 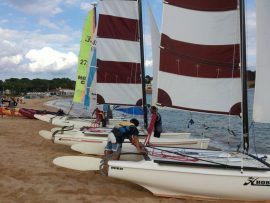 The Vela and Kayac Sant Pol-Costa Brava school offers a wide range of offers to suit your needs. We offer catamaran courses of 2 or 5 days for those who want to start catamaran management. 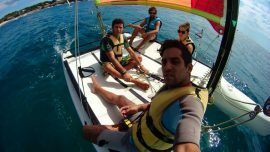 We also have the option of catamaran rental for those who already have an optimal level of catamaran and want to rent on their own. We have hobie Cat 15 ideal for catamaran sailing thanks to its fast design. But at the same time stable and safe. We also have instructors with extensive experience in handling these boats and in the training of students. In addition to learning how to navigate, you can enjoy a marvelous environment such as the beach of Sant Pol S’Agarò in the heart of the Costa Brava. The characteristics of the bay, its beach, the wind regime and its landscapes make’s it a privileged place for nautical sports, especially for sailing and catamaran.